Rice students and faculty designed and built a dwelling of modest size (500-square feet) with a small projected budget ($25,000.00) while implementing innovative design and construction techniques. Our project, set in a neighborhood in need of affordable housing, is a modern interpretation of the shotgun-style structures that are disappearing from the area and serves as a prototype for use in various Houston communities. An adjustable footing/foundation system lifts the building off the ground (like its neighbors on concrete block footings) and if needed, may be adjusted for Houston's expansive soils. Hardiplank walls and metal windows are used instead of wood to reduce future maintenance. 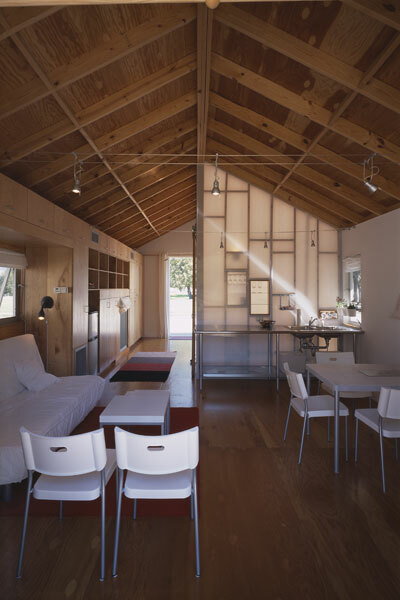 The core of the house is wrapped in polygal (which distributes light from the center of the house) and its placement divides the building envelope into "large" and "small" rooms that may be furnished in a variety of ways. All storage and services are collected in the thickened west wall and porches offer places for gathering, extending the interior living areas.